Throughout his oeuvre, Hountondji develops a prescriptive notion of culture that is marked by internal difference and constant change. This notion stands in opposition to a static and essentialist understanding of culture, that is prevalent in many contemporary nationalist and identitarian movements and that leads to a society’s stagnation and enclosure. Hountondji develops the analytic category of “culturalism”, designating the strategy by politicians of using cultural topics to divert attention from important economic and political issues. This chapter further highlights the implications of Hountondji’s call for cultural pluralism on a political, normative, and theoretical level. 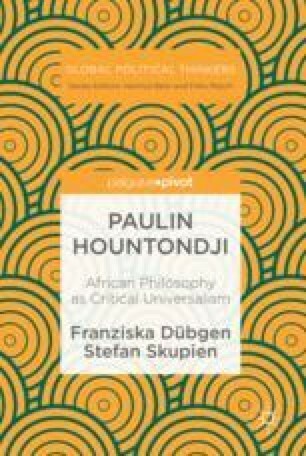 In addition, it elucidates his critique of culturalism by discussing practical examples in the African context and delineates contemporary trajectories of this critique.